Before relocating to North Carolina for graduate school this past summer, I lived for eight years in New York City. The city offered some of the world’s finest food and culture—four-star meals at Daniel, La Traviata at the Metropolitan Opera House—but the one thing not readily accessible was natural beauty, though I tried hard to seek it out. My go-to spot was a small, nondescript bench at the peak of Fort Tryon Park, one of Manhattan’s highest points, where I could see the Hudson River laid plain. But as anybody in New York can tell you, nothing in the Big Apple comes easy, and enjoying the view was no exception. There were all manner of distractions to contend with: the endless noise of buses and trucks rumbling along the Henry Hudson Parkway a hundred feet below, the bleating of car horns, the smog roiling up from factory furnaces on the other side of the river bank. And yet if I sat there long enough, eventually the world would grow quiet, and I’d notice the elm tree branches overhead perfectly framing my view of the river. “The Blue Tree” by Rick Bass in Lookout’s recent anthology Astoria to Zion: Twenty-Six Stories of Risk and Abandon asks how we hold just such a moment. In it, the main character, Wilson, struggles in nature as much as he enjoys it, and grapples with the impermanence of youth. The story begins with him, his wife, Belinda, and their two daughters, arriving at their cabin in the woods the day before Christmas Eve. Tradition dictates that Wilson cut their tree that night; he wants everything—as in years past—in place for a restful Christmas Eve. Against Belinda’s better judgment, Wilson packs his daughters in the Subaru and heads north in the falling snow, deeper into the forest, where the best trees can be found. They get stuck, of course, just as his wife had predicted. Wilson digs out the area behind each wheel. He climbs into the driver’s seat and presses the gas pedal, but his attempts only make matters worse. “The car has become an ice-making machine, a perfect arrangement of temperature, humidity, dew point, and snow depth … and Wilson realizes, with an unpleasant jolt, that they’re screwed.” As Wilson and his daughters begin the three-mile trek back to the cabin, his girls take sides in an impending argument. The eldest, Stephanie, rolls her eyes at her father’s stupidity; the younger, Lucy, defends his actions. 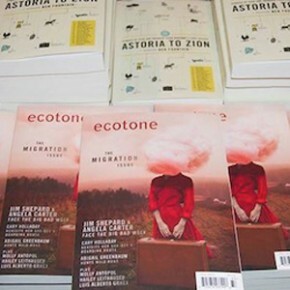 To enjoy the story its entirety, read “The Blue Tree” in Astoria to Zion: Twenty-Six Stories of Risk and Abandon from Ecotone’s First Decade.